Your oral health goes beyond your teeth and gums. Your jaw is an essential part of your overall function, and if you’re experiencing problems with your TMJ (the small jaw joints), we can offer treatment through TMJ therapy at our Weatherford, TX dental office. Problems with the jaw can lead to chronic headaches, jaw pain, and tooth damage. With TMJ therapy, we can help you avoid these debilitating symptoms of dysfunction and encourage comfort. We offer non-surgical TMJ therapy using intraoral appliances. One of the things that can trigger TMJ dysfunction is teeth grinding or clenching, and oral appliances can be created to prevent them from happening. Sometimes, TMJ problems can be caused by slight misalignments in the joints, and we can create intraoral appliances that reposition the jaw to reduce the strain and encourage proper positioning for improved function. We utilize computerized jaw joint analysis technology. 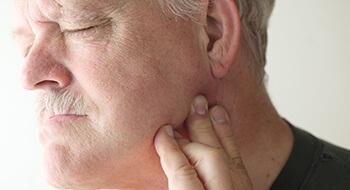 The JVA is a fast, non-invasive method of measuring temporomandibular joint function. Wave signatures are recorded on a computer, which aids in the diagnosis of a variety of TMJ issues. Some of these problems can include perforations of the disc, displaced discs, degenerative joint disease, and tears. The GemPro, EMG tracker, can actually measure the forces of grinding and clenching which can contribute to TMJ problems. Fortunately, Dr. Deborah Romack and Dr. Garrett Mulkey can treat many of these problems right here at Cosmetic & Family Dentistry of Weatherford. If you’re experiencing chronic head, neck, jaw, or shoulder pain, consider a visit to our office to find out if the problem is caused by TMJ dysfunction (TMD). Patients from Weatherford, Aledo, Brock, Millsap, Mineral Wells, and Springtown turn to Cosmetic & Family Dentistry of Weatherford for complete TMJ therapy and so much more.